Ever wondered how blind athletes compete at track and field events? They do so with the help of sighted guides, who serve as their eyes. The guides run alongside the blind athletes, matching their step and alerting them to possible obstacles and guide them around turns. They are bound to the athlete with a tether so he or she stays in step. In many countries around the world, sighted guides are supported by the government and given access to coaching and other facilities, so they can keep pace with the blind athlete. That is not the case in India. This must change, says Paralympian Ankur Dhama, who is the first visually impaired Indian to take part in an athletics event. Dhama has made a strong appeal to the government of India to step forward and support sighted guides for totally blind athletes so they can do better at international-level events. Being a guide to a blind runner in a competitive event comes with many challenges. For one, the guide has to match pace so the leg and arm motions are synchronised. However, guides cannot cross the finishing line first as they stand being disqualified. Running with the hands bound by a tether is not easy either. This means guides have to undergo the same level of training and cannot just land up on the day of the race. 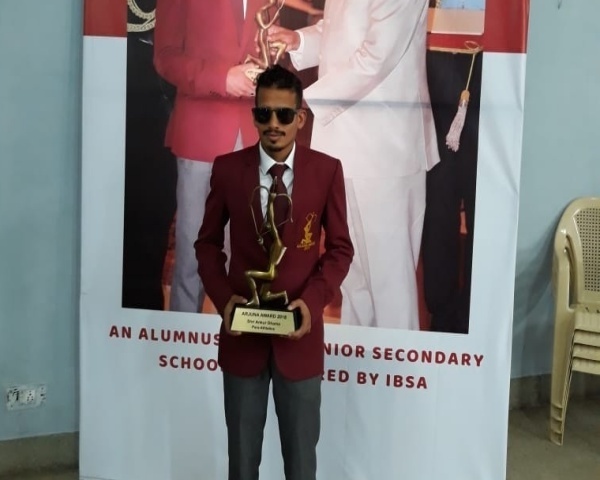 "Totally blind runners need a sighted guide," asserts Satyapal Singh, who has been coaching Dhama and other disabled athletes for free in New Delhi for decades now. Singh is one of India's most decorated coaches, having trained outstanding Para-athletes like Yogesh Kathuniya, Sandeep Singh Maan, and Deepa Malik, to name a few. "A 100% blind athlete cannot take a step forward without a sighted guide" says Coach Singh. "He has to show the way forward, has to coordinate with the athlete and therefore needs to be trained like him so that the height and running action match." Coach Singh says that many other countries support the training of sighted guides, something India needs to do as well to produce more athletes like Dhama. Not just athletics, sighted guides are an essential part of other Paralympic events like cycling, football and alpine skiing as well. Dhama, who won three medals in the 2014 Asian Para Games, wants to compete for another 8-10 years, but fears the lack of sighted guides could come in the way. "At the international-level, sighted guides are given the same benefits and facilities as visually impaired athletes. That must happen here as well, so we can give our best." Blind marathoner Amarjit Chawla, also known as Sporty Sikh concurs. "The government must support competitive runners as they are representing the country. They have to qualify at various levels and given those challenges, they must get the benefit of sighted guides. " However, rather than look to the government for help, Divyanshu Ganatra, Founder, Adventure Beyond Barriers Foundation (ABBF), says it is time to look at more creative approaches. "There is a need to look at sportsperson with disabilities as equals and not charity cases or second-class citizens," says Ganatra, who has spearheaded inclusive adventure treks and expeditions in India. "The fact is that even non-disabled sportspersons are struggling for support. Rather than always look to the government, even private organizations should come forward to support and fund such initiatives."